Has this ice cream hit Rock Bottom? Yesterday I met up with Chris (that's him with the Mini Sundae below), who I used to work with at Houghton Mifflin College Division before it became Cengage. We used meetinbetweenus to find a good place to meet up and that became Rock Bottom. I have to say, I am not a big fan of chains, and recently I have stopped ordering chicken at restaurants because I find it too dry. This time I was so in the mood for their Chicken Waldorf Salad...if the chicken was bad, I'd eat around it, right. Well, I didn't eat around it. The salad was amazing, as was the chicken. So was our waitress, Susan. She was cheery and helpful, and was right there whenever we needed anything. Granted when we first arrived at noon the place was empty, but I have a feeling she would have been one of those good waitresses no matter how many people were there. She twisted my arm -- yeah, right -- when she suggested we finish off with a Mini Sundae...one scoop of ice cream in a shot glass. Chris and I shared it. Perfect end to a great meal. And great idea and great size. The mini sundae is a smaller version of their Pint Glass Sundae: "A Rock Bottom Original! Scoops of Starbucks® Mud Pie ice cream, crumbled chocolate wafers, candied walnuts and Stout hot fudge. Topped with whipped cream and a cherry." (from the Rock Bottom Desserts web page). Funny thing is, I hate coffee. I hate coffee flavored anything. But I was so excited about "reporting back" on this adorable sundae, I didn't even read the description. And guess what? The coffee ice cream worked...It balanced off the sweetness of the chocolate wafers and hot fudge. Wait...what? Stout hot fudge? I don't like beer flavored anything either. Man oh man. But hey, didn't notice that either. That was one darn good sunday seeing as it was made of two flavors I don't like and I liked it!!! So this is odd. I went to the Pinkberry site to try to explain Pinkberry to my friend Melanie and guess what? 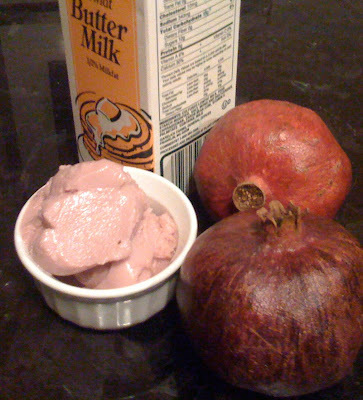 They now have Pomegranate Frozen Yogurt! So weird since I just wrote a post about a Pomegranate Buttermilk Sorbet I thought must taste very much like what would happen it Pinkberry made a pomegranate flavor. And they do! I promise I did not know they had when I wrote my post or created my ice cream -- I was just trying to use up ingredients and make my Buttermilk Sorbet taste better! Image from the pinkberry.com site. Today, more than a million joined together in the nation's capital to welcome in the 44th president of the United States. If you were not among those out there in the bitter cold, have no fear...you too can simulate the cold by enjoying in our favorite treat -- ice cream! Well, I am off to watch the parade on TV. I love parades! So its been over a year since I started my ice cream making escapades and I sure have learned a lot along the way. I can't say I have perfected the art or science of making the perfect batch but the process I finally get, so in 2009 I am challenging myself to not follow recipes to every last ingredient and to try to make some flavors of my own or at least switch up some basic recipes. So here I go, this is my first try and I am rather pleased with the outcome. I was first inspired by a Chocolate Velvet Ice Cream recipe from the recipe book Ice Cream: The Whole Scoop. It was exactly what I was looking for but the one issue I had was that the recipe calls for eggs but it did not call for cooking them. Being pregnant, I am a bit wary of that so this was the perfect excuse to start experimenting. Here 's how I came upon my Hot Creamy Cocoa concoction. I took a look at that recipe and thought about what exactly did I want? I knew I wanted a rich chocolate but I also always wondered how some ice cream shops make a chocolate that is a super dark brown (the flash made the ice cream in this photo look lighter than ice cream actually was...its not exactly what I was hoping for but still a bit darker and richer) and so creamy. How come mine never comes out that way? So I started with this basic recipe and first added more cocoa than it called for to make it richer and more egg yolks to make it denser and creamier. Then I felt like it needed a little bit of vanilla for more flavor. And really I just kept adding a little more cocoa and sugar until I got the color and flavor I thought was perfect. This definitely was a test run and I had a lot of fun making it my own. For once I wasn't so concerned about following the words on a page and added a little of this a little of that and couldn't wait to see what happened. 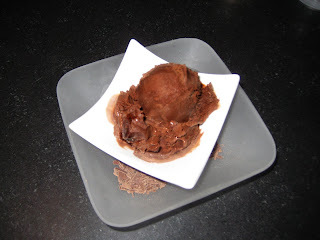 The result...a super creamy, oh so chocolaty, cocoa flavored ice cream that I am quite proud of. I did find that it freezes a bit harder than other ice creams I have made so I just let it sit out for a bit but overall I love it. As my 4 year old ate it she said "Mommy, this tastes like a yummy chocolate whipped cream or a chocolate bar!" I take that as a compliment coming from a girl who knows her sweets (not so proud of that but she does take after Mommy!). She also kept asking me what my "secret" ingredient was. Hmmm...never thought of it that way and was stumped on how to answer her! I guess I would say the cocoa. I didn't try to be fancy by mixing different chocolates. I just let the good old Hershey's unsweetened cocoa speak for itself. Combine 1/2 cup sugar and 1 cup cocoa in a small bowl. In a medium saucepan, heat milk and sugar/cocoa mix thoroughly. In a separate bowl, lightly whisk 5 egg yolks. Add heated milk mixture to egg yolks, whisking constantly. Pour egg/milk mixture back into the saucepan and add heavy cream and vanilla. Heat on medium heat, stirring constantly with a rubber spatula. Heat until the custard lightly coats the spatula. (Do not boil...you will get scrambled eggs) Remove from heat and pour through a fine strainer (helps to smooth the texture) back into a clean mixing bowl. This is where I added the remaining sugar and cocoa to perfect the flavor. Cool over an ice bath and refrigerate for at least 4 hours. Then freeze in your ice cream maker according to your machine's directions.. Happy Blogiversary to Us Winner! 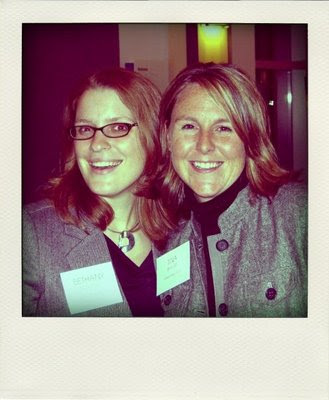 Congrats to Janelle for winning in our Happy Blogiversary to Us post! I am glad she won because it brought me to her site with some fabulous looking Whole Wheat Pumpkin Chocolate Chip Cookies -- wait -- this looks very similar to my mom's recipe except with whole wheat flour instead of regular. And yes, I have tried pumpkin chocolate chip ice cream, but I will for sure have to revisit it, because I wasn't thrilled with it the first time I made it -- but there is always room for improvement, yes? So it's time for another SpiceDish Saturday. I am going to let SpiceDish's post and pictures speak for itself! Thanks, SpiceDish! I love champagne sorbet. It was a special occasion treat for me growing up. Every time there was a special occasion birthdays, anniversaries, graduations etc. my dad liked to go to a very small little French restaurant run by a Turkish chef. He always made champagne sorbet for us when we came in. It was the perfect palate cleanser. But beyond that it was perfectly pink, perfectly sweet and made my teenage self feel very grown up and sophisticated. This is where you can use not leftover champagne, because lets face it… who has leftover champagne… but maybe you have that bottle that you passed out before you opened. This recipe is very easy. You can either make it in an ice cream maker or make it 'granita' style. Heat the water, grapefruit juice and sugar in a saucepan over medium heat until the sugar is completely dissolved. Remove from heat and chill completely. Once completely cold add the champagne and stir until well blended. Either place in ice cream maker and freeze according to directions or pour mixture into shallow baking dish. Place in freezer and freeze mixture for 2 hours. With a fork, scrape and break up the mixture. Freeze another hour and then scrape again. Repeat until you achieve a frozen texture you like. I like to serve with a mint sprig. So lucky for me that Lisa doesn't read my blog that much, because then maybe she won't know that dessert tonight is made up of leftovers! I made my favorite carrot cake on Sunday, followed that by a quick bread, and I was still left with two cups of buttermilk. I don't know why they don't sell it in smaller quantities, because I don't know of one recipe that uses more than a cup of it at a time! So I looked up buttermilk recipes and came across a lot for buttermilk ice creams and sorbets. So I decided to follow one of the recipes from Cooking Light -- which was basically two cups of buttermilk, 1/4 cup of sugar, 1/4 cup of corn syrup. I mixed and tasted it, and while thrilled I wasn't wasting any buttermilk, I wasn't so thrilled that it reminded me a lot of Pinkberry (and you know my feelings about that!). Should I add lemon extract? Orange? Then it hit me...I had a lot of homemade grenadine leftover from when I tried my first stab at Shirley Temple Ice Cream. I added 1/4 cup, but thought it needed more, so I added another 1/4 cup for a total of 1/2 cup of grenadine. The sorbet froze up nicely, with a muted wine color. It still tasted a little yogurty to me, and with my sweet tooth, even though I love yogurt, when I am after frozen treats, I much prefer sweet sweet sweet! What was nice about this recipe was that it was easy and quick. There was no stove prep, which was a nice break. Lisa and I both liked the sorbet. As Lisa put it, "I feel like I shouldn't like it, but I do!" I know that sounds crazy, but I understand what she meant. It was very refreshing (I think it would be a great summer treat!) and at the same time, the sourness of the buttermilk was balanced by the sweetened grenadine. Would I make it again? Not just for me. But it most definitely is a contender for I Scream 2009! Today marks the one year anniversary of Scoopalicious! On January 2, 2008, Tina wrote the first post...little did she know that over those first days of January 2008, Bethany too was contemplating starting an ice cream blog! So we joined forces on January 8, 2008, and Scoopalicious as you know it today was born! Tell us what your favorite post was over the past year and enter to win some coupons for free ice cream! Deadline is Monday, January 12th. Please be sure to include an email address at which we can contact you. Head over to Ice Cream Journal for a picture of the World's Most Expensive Sundae that is worth a thousand words. And if that isn't enough, they also have a wonderful description. My question is: how many people have ever ordered this sundae? God love the Food Network...what would I watch without it. Tonight I discoverd a Chicago favorite and classic ice cream treat that sounds oh so yummy. 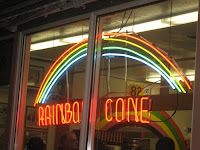 It's the "original Rainbow Cone" and it was highlighted on a recent episode of Unwrapped. I love to hear about must haves in different cities and this is one that is quite simple but unique. And one I must try the next time I make it to Chicago (hubby goes there often, may have to piggy back just for this!). So what is this "Rainbow Cone"? 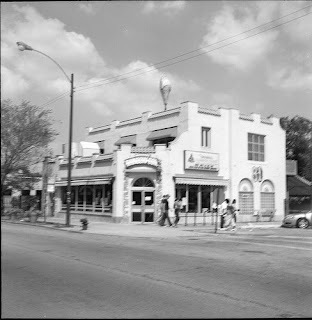 Back in 1926, on Chicago's South Side, this special treat was created for a mere 12.5 cents and 82 years later its still kickin, with lines out the door, but at a whopping $3.50. Simply its a plain cone stacked with first chocolate ice cream, then strawberry, Palmer House (french vanilla with cherries and walnuts), pistachio, and orange sherbet. And yes in that exact order every time making a rainbow of sweet colors. The sherbet is your first lick to cleanse the palette (pretty fancy!) and the chocolate is on the bottom to not intefere with the nuts and fruit flavors. Wow, a true science to this one. Oh and they also are very particular about how its placed on the cone. They don't scoop, they slice so it really creates an arch of flavors (thus the rainbow) not scoops on top of eachother. It's pretty cool. Wish I could find a picture. According to one Yelp visitor, "this is a Taste of Chicago staple, this place is like heaven for the indecisive, because an Original Rainbow Cone has five flavors of super sweet and creamily old timey ice cream all piled up together on the same cone..."
Time to get to the Windy City!